The recent national disasters that have displaced so many people has brought the Worcester community together to offer support and services for those in need. The City of Worcester, Centro, the American Red Cross and other community partners, have been collaborating and finding ways to assist those who have been displaced by the recent hurricanes. Quinsigamond Community College also stands with its community partners and is working to find ways to make a difference for those who have been devastated by these natural disasters. “We have received calls from students from the affected areas and are working to find ways to make it easier for them to attend QCC. I am prepared to take the necessary steps through fee waivers or other measures to ensure affordable access to higher education for these folks until they establish residency,” said President Dr. Luis J. Pedraja. The City of Worcester has outlined 3 steps for new residents who have been displaced by these disasters to follow, along with a list of programs and services available to them. This will be an ongoing initiative and will evolve as things progress. View a Guide to the City of Worcester Services for new residents affected by hurricanes. The increase of opioid-related deaths has grown to epidemic proportions both locally, regionally and globally. The Centers for Disease Control and Prevention cite that six out of 10 drug overdoses are opioid-related. In Worcester, there were 77 opioid-related deaths in 2015 and 56 in 2016. At Quinsigamond Community College, those statistics are not surprising to the college’s paramedics students, who recently took a refresher course on how to administer Narcan (a drug that can reverse the effects of an opioid overdose). “The students who were there have already been EMT’s for a minimum of one year or longer. Many have already administered Narcan in the field, so this was more of a refresher for the group,” said QCC’s Program Coordinator of the Emergency Medical Services Program, Cheryl Finn. Administering Narcan is a topic that is covered regularly in both the EMT and paramedics programs at the college, and is a required skill for the national curriculum of both programs. At Quinsigamond Community College, successfully preparing students to enter the workforce is a key component of the college’s manufacturing and engineering programs. From collaborating with companies, staying abreast of the latest trends and technologies, to working with the latest manufacturing equipment, QCC’s manufacturing and engineering programs have advanced the careers of countless students. One such student is Nick Voyer. Mr. Voyer is a Manufacturing Technology student who has come to QCC as part of a toolmaker apprentice program with Tegra Medical, headquartered in Franklin, MA. Tegra Medical offers a four-year apprentice program that allows participants to enroll in a local engineering program. The company pays the tuition and participants continue to work at their jobs while attending college. Mr. Voyer is a five-year employee at Tegra Medical and was excited to be a part of the first group of employees who took advantage of the apprentice program. He said he saw this as a great way to advance his career both in the short and long-term, adding that had he not joined the apprentice program, he would not have had the motivation to go to college. Traveling back and forth from his home in Gardner, to his job in Franklin, to classes at QCC’s main campus in Worcester, means Mr. Voyer logs many, many hours in drive time. While the logistics can sometimes be challenging, he said the practical experience he is getting at QCC is invaluable to him and his future. In May 2018 he will graduate with his associate degree in manufacturing technology. Tegra Medical’s Director of Manufacturing, Brian Rua, said the company has also benefitted from the education Mr. Voyer is receiving at QCC. Toolroom Tech Lead Jeff Mercier heartily agrees. Mr. Mercier is Mr. Voyer’s immediate supervisor. “The Solidworks and AutoCAD classes Nick took gave him the foundational theory of what we do and he applied that knowledge here. This helps both us and the college,” Mr. Mercier said. In June 2017, Mr. Voyer earned the title of Journeyman Toolmaker and even went one step further by applying his new found confidence in public speaking to his work at Tegra Medical. The future is bright for Mr. Voyer. He recently bought a house with his wife and is looking to continue his education with the goal of moving into engineering and transferring to Fitchburg State. “He’s a rare young man, very aggressive and always bettering himself. He has a high level of motivation and takes a more aggressive schedule than most folks in the apprentice program,” Mr. Rua said. Nine female QCC students saw firsthand what amazing opportunities and capabilities QCC’s Fab Lab has to offer through a recent tour of the facility. The tour was arranged by on-campus support group “Women in STEM” (WIS), whose mission is to provide academic, social, and professional mentoring and support to women in STEM programs at QCC. Located on the first floor in the QuEST building, the Fab Lab contains various types of design and fabrication equipment that students, staff and faculty can learn to use in order to help transform their ideas into reality. Fab Lab Manager Alex Gray and student assistant Elijah Boudreau demonstrated the capabilities of the lab to the students, including the different types of 3-D printers that can make items from various materials; a laser cutter for precision trimming; a vacuum former for making molds; a vinyl printer for creating banners and decals, and an embroidery machine that uses colored thread to personalize items. Mr. Gray helped the women create a logo for WIS during the tour and the students plan to produce the logo and transfer the design onto shirts using the vinyl printer. Students who participated include Maame Amoah-Dankwah, Narda Bondah, Rose Duchemin, Cathy Evans, Triomphe Kanyeba, Cheryl Ann Letson, Monica McMullan, Savanna Russell, and Emilyrose Sandgren.They were accompanied by Professors Andreana Grimaldo (Mathematics) & Anita Soracco (Environmental / Physical Science), who led the group. Women in STEM is a new organization on campus and membership is open to any QCC woman studying in a STEM field, according to Professor Grimaldo. It is sponsored by QCC’s STEM Starter Academy (SSA) program, which is managed by Darcy Carlson. Plans are being finalized for a "Final Exam Good Luck" pizza party and student attendance raffle on Tuesday, December 12 at 12:30 p.m. in room 313 in the QuEST building. 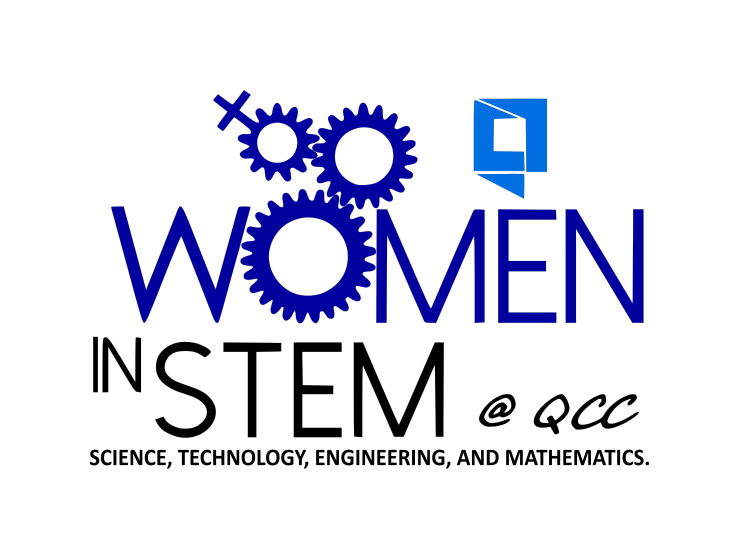 An email invitation will be sent to all QCC women who are enrolled in STEM majors. Any woman wishing to come the group can email either professor or come to an event. For more information reach out to amygrimaldo [at] qcc.mass.edu (Professor Grimaldo) or asoracco [at] qcc.mass.edu (Professor Soracco). At Quinsigamond Community College, the mathematics department has discovered a way for students to increase their chances for success while completing their degree in a timely manner, through the college’s accelerated math program. Accelerated math classes are longer classes over a shorter period of time. A two year study done by the college showed that students consistently passed the accelerated math classes at a higher rate than both traditionally scheduled classes and classes taken online. Across all of the courses over that timeframe, all accelerated math courses had a pass rate that was 12 percent better than traditionally scheduled courses (sample size 4,489 students) and 25 percent better than courses taken online (sample size 744 students). According to Dr. Leslie Bolinger Horton, Dean for the School of Math and Science, the math department looked at the success rate of students taking summer sessions, which are traditionally offered in longer time blocks for a shorter period of time, and found the success rate for these types of classes outpaced traditional and online classes. The college’s accelerated math classes offer students the ability to take their math classes twice a week in three-hour blocks, as opposed to traditional math classes that meet 50 minutes, three times per week. Students have the same learning requirements as those in traditional face-to-face and online classes, however, with the duration of each class period being longer, students are able to complete their course in just seven and a half weeks as opposed to 15 weeks. These longer time blocks allow students more time to process content and provide professors with more time to help individual students as needed. The accelerated classes offer a more relaxed atmosphere, due in part to students not being limited to a 50-minute time block. While students are still responsible for mastering the same learning objectives as those in traditional classes, they are able to spend more time on a math concept that may pose a challenge for them before moving on. While one might normally think accelerated math classes would only be for the student who is drawn to mathematics, it has been shown that a longer period of contact time in class with the professor is what all students seem to need. Associate Professor of Mathematics, Sheiba Mas-Oud, is one of the professors who has been teaching the accelerated math courses. He noted that his own classes supported these findings. “The success rates in all the accelerated courses that I taught were at least 40 percent more than my traditional regular semester courses,” Professor Mas-Oud said. Professors also seem to be drawn to this type of class learning. “We find the professors love this type of class as well. It allows students a greater amount of time to articulate questions and professors a greater amount of time to explain concepts and clarify student questions,” Dr. Bolinger Horton said. QCC Liberal Arts major Lizabeth Da Silva said taking an accelerated math course was one of the best academic decisions she’s made. “My experience taking an accelerated math course was a positive one. I liked the overall curriculum in both accelerated math courses I took, from the interaction with the professor on campus, to the work and assistance MyMathLab™ offered,” Ms. Da Silva said. Dadbeh Bigonahy, Professor of Engineering & Sciences said his engineering students were happy to be able to take the required math classes in a quicker timeframe in order to advance faster in their academic careers. “I told my students they can get to their dream faster by taking two math courses in one semester,” Professor Bigonahy said, adding that all of his engineering students are required to take a variety of math courses. This spring, QCC will be offering a variety of accelerated math courses that include intermediate algebra; college algebra; statistics; pre-calculus and trigonometry. “What students should keep in mind is that even though this is a fast-paced course, the professors at QCC are prepared and equipped in assisting students’ needs while meeting the course's deadlines and syllabus,” Ms. Da Silva added. To learn more about QCC’s accelerated math courses, visit the Math Department's Web page. Stop by Quinsigamond Community College’s cafeteria most mornings and you’ll find a group of students intently playing a game of chess. More often than not you’ll also see their animated and passionate advisor either playing a game with them or quietly offering advice. The students are part of QCC’s Chess Club and QCC Art Professor and avid chess player, Jerry Williams is the club’s advisor. QCC has had a chess club for years, averaging between 10-15 players a semester. Mr. Williams has been a part of the club for as many years, working hard to dispel the stigmas that are sometimes associated with chess, and getting students to understand and appreciate the game. As a devoted chess player himself, Mr. Williams is coached by American chess player, Marc Esserman, who is ranked 40th among active chess players in the U.S. by the U.S. Chess Federation. Mr. Williams brings the knowledge he gains from Mr. Esserman to the students he advises. In fact, Mr. Williams has lined up Mr. Esserman to come to QCC for some personal coaching sessions in the near future for anyone who is interested. Additionally, he is working to set up a “simul” chess tournament with Mr. Esserman, where Mr. Esserman will simultaneously play between 20 and 30 people at the same time. Mr. Williams has done these types of “simul” tournaments himself. Most recently at the Octoberfest in Douglas where he simultaneously played multiple people. All proceeds from the tournament went toward the Douglas Library, where his wife is a board member. In October of this year, QCC sponsored a U.S. Chess Federation official tournament that featured four rounds with prizes given for first, second and third place. The event drew between 30-35 players and included three U.S. masters and one expert, in addition to QCC students, the public, and four fifth and sixth grade elementary school students from Douglas. The elementary school students were part of a group of Boy Scouts from Douglas. Mr. Williams teaches them about chess once a week and is quick to note that chess is for anyone of any age. In chess, age is not a factor. Young can play old and vice versa. Mr. Williams said his young players have been working hard to learn the game. QCC students interested in playing chess or those students who just want to stop by to watch and learn, can visit Room 367A in the Administration Building any Monday, Wednesday or Friday between 3:00 p.m. – 5:00 p.m.
Mr. Williams has some sage advice for those interested in playing chess. “Everyone who plays needs to be passionate because when you are not passionate you don’t do the work,” he said. 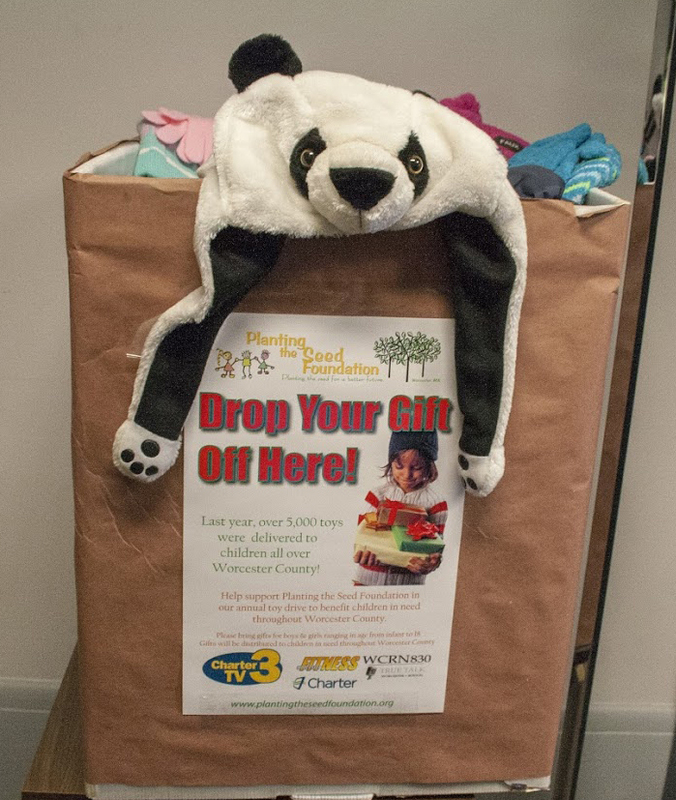 For the sixth year QCC will be holding its Annual Hat and Mitten Drive to benefit children and adolescents in the Worcester and Southbridge area who are in need. Please consider donating any NEW hat and/or mittens or gloves (any size, color or gender). All donations distributed in the Worcester area will be done by an "army of elves" from the Planting the Seed Foundation, Inc.
QCC’s annual holiday program, Feed-A-Family was developed to help families in need celebrate the holidays. For decades the program has been providing holiday meals to QCC families and bringing good will to all through the simple act of giving. Last year, QCC Campus Police and Counseling Services teamed up with Stuff-A-Cruiser, becoming an important support program to the college’s Feed-A-Family Program.This year the college will once again offer both programs to help those in need. For those looking to nominate someone; fill out the nomination form and provide the name and additional required information of students, faculty or staff who may need assistance during this holiday season. Please keep nominations confidential and submit them in a sealed envelope to QCC mailbox #144. The college community forwards the names and pertinent data to the Feed-A- Family Committee. To date, no one has been turned away. All cash donations received for the Feed-A-Family program are used to purchase gift cards to a local grocery store. In addition to monetary donations, the QCC Campus Police are asking faculty, staff and students to stop by one of their Stuff-A-Cruiser events where faculty, staff and students can bring a new, unwrapped toy, gift card or movie tickets for a Feed-A-Family child. Please take some time and join the QCC Police and other assisting departments for some hot cocoa and a small token of appreciation. QCC mailbox #144 donations and nominations accepted until December 7. Please make all checks out to: QCC Feed-A-Family. Recipients will receive a food gift certificate to purchase a holiday meal of their choice, and toys for their children will be provided by the Stuff-A-Cruiser program. If you cannot stop by during the scheduled days, please feel free to donate at one of the drop boxes in Room 162A, the Fuller Center, 25 Federal St. or with the QCC Police Department. Toys & donations will be also be accepted until December 8. 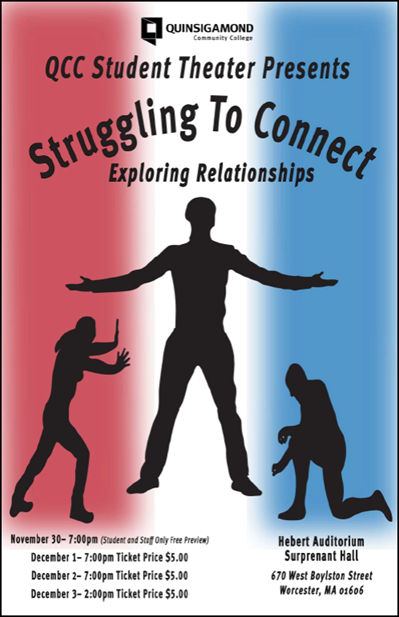 QCC's Fall Student Theater Production, "Struggling to Connect - Exploring Relationships," was preformed in Hebert Auditorium Suprenant Hall on November 30 - December 3. Read below for an opening night review by QCC Professor of English, Margaret Wong. "QCC Student Theater has come of age. In the production of Struggling to Connect, there was nothing merely superficially entertaining about what was presented. Rather, the audience experienced the results of thoughtful hard work on the part of a very talented cast, grappling with the full range and depth of what human connecting entails. The production’s structure was starkly simple. A triad of individuals come on stage, holding hands, physically connected to one another. Then the connection is broken as the center member moves upstage, alone, to tell a story, make a phone call, or deliver a statement. Upon conclusion of the monologue, the lone speaker reconnects to the others, and the triad goes off stage, holding hands again, connected again. Backgrounded by the disconnected silent witnesses who hang back — to illustrate, emphasize, or shadow — the statements of the monologist emerge exposed and riveting.The raw emotions on display as stories are told of untoward acts, imminent loss, assault, and killing, draw us in, even as they make us aware that we are voyeuristically witnessing something deeply personal and private. In the final scene, one voice begins to sing Paul Simon’s “The Sound of Silence,” followed by a second, then a third, until the whole cast is on stage singing together, connected in song. The lyrics, which declare the inescapability of aloneness and silence, are countered by the presence of the connected voices, and therefore, the production leaves the audience with the awareness that human connecting is very much possible. The production celebrated human connection, but it did not shy away from honestly dealing with the emotional damage of lost love or the devastation caused by female battery and institutional racism. If you saw this play, you learned something about yourself and the world, and you came away impressed with the quality of QCC Student Theater." For the last three years Quinsigamond Community College has been offering a Winter Wellness Workshop designed to relieve stress from the semester and help students prepare for their final exams. These wellness workshops have been in place for six years and are offered twice a year at the end of each semester. Activities at these events are designed to help students de-stress. Stress-free activities include anything from massage, reiki, arts and crafts, coloring, Zumba and yoga, to bringing in service animals through the organization, Paws for People. The Paws for People program, affiliated with Cummings School of Veterinary Medicine at Tufts University, is always one of the hits of this biannual event. On Nov. 29, the organization once again came to the college’s main campus to kick off the two-day event with a few dogs and one cat that offered students a chance to pet the animals and just relax. The animals have been proven stress reducers for the students. “Students who you haven’t seen on campus will come right in when they see the animals,” said Mike Beane, Director of Student Life and Leadership. “It’s good for the students to hang out with each other and pet the animals,” said Kristie Proctor, Director of Disability Services, adding that the handlers also engage with the students talking to them about their classes and interacting with them. Ms. Proctor was the impetus behind bringing the service animals to QCC. “What inspired me was that I’m a big animal lover. I said we have got to bring these animals to campus and then everyone jumped onboard,” she said. In addition to the Worcester campus event, a stress-free wellness event also happened at QCC’s Southbridge location. Tami Strouth, Coordinator of Disability Services in Southborough brought in a cat organization for students to visit with cats and kittens, in addition to offering a mindfulness session, coloring and massage. Other events scheduled during the two-day event on QCC's main Worcester campus (Nov. 29 & Nov. 30) included mindfulness, coloring, massage and a sounds therapy session led by faculty member Jean Kennedy. In a sounds therapy session the tonalities and vibrations emitted from the bowl are used to help reduce stress and can aid in pain management. Ms. Proctor said that QCC is extremely supportive of the student experience and offers activities that will get students to interact more and feel part of the community. Quinsigamond Community College was selected as a top school in the 2018 Military Advanced Education & Transition Magazine Guide to Colleges & Universities research study. The guide is a comprehensive research tool for service members, education services officers and transition officers.Colleges and universities must fill out an extensive questionnaire that evaluates higher education institutes on military culture, financial aid for veterans, flexibility, on-campus support and online support services. In other Veteran news, QCC Veterans Club members were part of the annual Worcester Veterans Day parade held each year in Worcester. The parade coincides with Veterans Day, observed every November 11 to honor all American veterans who have served in the military of the U.S. In celebration of all veterans and to recognize the courage and sacrifices of those who served or are currently serving, Veterans Affairs has also placed a “Military Appreciation Tree” on display in the Veteran Center—Room 258A. “Stop by or email your request if you would like a ribbon placed on the tree in honor of a veteran who you have known. Please indicate what color ribbon you would like placed on the tree,” said Paula Ogden, Director of Veterans Affairs. The Veterans Affairs office will also be sending out holiday care packages cards and letters to service men and women who are currently deployed in Afghanistan and local Veterans hospitals during their annual holiday drive. 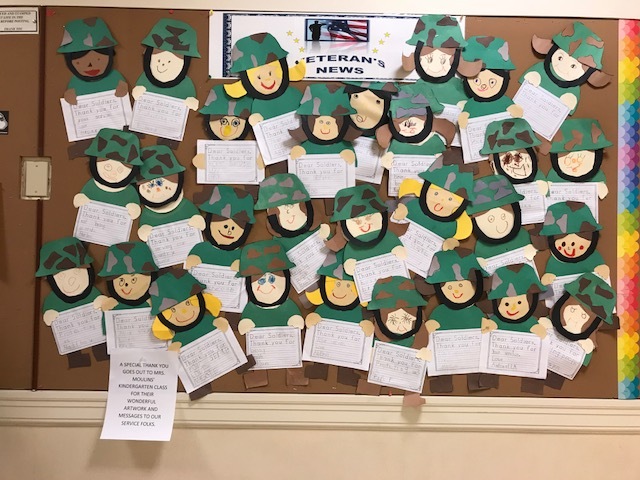 “Outside of the registrar’s office is our Veteran Affairs bulletin board where we’ve displayed artwork and messages that were sent to us from a kindergarten class at the AMVET Elementary School in North Attleboro, MA. The school's name stands for 'American veterans' and was named in recognition of veterans,” Ms. Ogden said. "We’ll be sending all of these messages and artwork to the troops in Afghanistan in a couple of weeks." 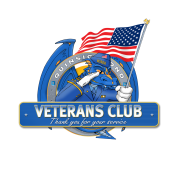 Those wishing to send an item or card can drop off their items to the Veterans Affairs Office in Room 258A or at the security desk at QCC’s downtown Healthcare and Workforce Development Center. The deadline for dropping off items is December 8. On November 8, the Athletic Center gymnasium had a carnival-like atmosphere as students, faculty and staff culminated the school’s Spirit Week with a Spirit Carnival.The event was put on by Student Life and featured an obstacle course, games, a nacho bar, air brush beanies and an inflatable wall. Staff Attorney Alexandra Bonazoli of the Central West Justice Center, visited the QCC campus earlier this month to discuss some of the recent changes to immigration and immigration policies. Over 25 students, faculty and staff attended the informal discussion that focused on the current administration’s decision to rescind the DACA program. DACA, which stands for Deferred Action for Childhood Arrivals, was an immigration policy that allowed people who entered the U.S. as minors, either illegally or remained in the country illegally, to receive a two-year renewable period of deferred action from deportation and then they could become eligible for a work permit. Ms. Bonazoli discussed possible options for people who are being impacted by this decision, such as temporary protected status or “TPS.” TPS is a temporary immigration status to the U.S., granted to eligible nationals of designated countries. However, certain countries that currently have TPS status may also be losing their status, Ms. Bonazoli told those in attendance, adding that it is imperative to stay abreast of current information and be aware of what is going on. She said there are other options after DACA, which may be available to people on a case-by-case basis. Ms. Bonazoli cautioned people to make sure they obtain the correct information about their options. The Central West Justice Center provides free legal services to low-income and elderly families and individuals in central and western Massachusetts. “The legal services in our office are free and most attorneys speak Spanish. We also have someone in-house who speaks Portuguese and we have access to a language phone service,” Ms. Bonazoli said. For those who are interested in contacting the Central West Justice Center they can visit www.cwjustice.org and apply for help using the online form or by calling toll-free at 855-252-5342. Civic literacy is a top priority at QCC. In November, the college continued its civic literacy outreach by showcasing a voting display at the Alden Library. Created by Carolyn “Cary” Morse, Coordinator of Library Serials & Electronic Resources, the display offered students information about their voting rights as well as important dates to know. Students were also able to review a precinct voting map for Worcester and ask questions. At QCC, students, faculty and staff have access to the Athletic Center located on QCC’s Main Campus on West Boylston Street in Worcester. The Athletic Center provides the QCC community with a way to stay healthy through exercise. Studies show that exercising reduces stress, reduces cholesterol, prevents osteoporosis, and helps prevent coronary heart disease in both men and women. In addition, exercising helps to firm and tone your body, keep your weight maintained and increase your energy level. “You’ll also meet new people,” added QCC Athletic Director Lisa Gurlick. A vast array of machines are available at the Athletic Center in addition to men’s and women’s locker rooms that are equipped with showers, restrooms, changing areas, a sauna, and lockers. The gym features a full-sized basketball court, program room, Nintendo Wii Sports, Wii Fit, and a ping pong table, in a comfortable seating area equipped that is with wireless computer access. Weekly classes in yoga; full body toning and indoor cycling are also available. For a complete list of classes visit: programs and events. The QCC women’s soccer team wrapped up a great season with a team banquet that honored the players for their hard work and dedication throughout the season. All-Region Awards were given to Vanessa Hanger (All-Region 21 first team), Teena Manter (All-Region 21 second team), and Shelby Maiorana ( All-Region 21 second team). The basketball season is well on its way for both the men’s and women’s basketball teams. On November 16, during halftime at the men’s home basketball game against Bristol Community College, basketball sensation Ilze Luneau performed. 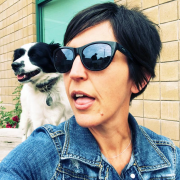 Ms. Luneau is known for her prowess with a basketball and is the first person to dribble five and six basketballs using just hands. She has been featured on the Today Show with Jay Leno and the Ellen Degeneres show. View the complete list of all men’s games. The Women’s basketball team has also started its season. This year the team has become a club team, taking their schedule down to 14 games. View the complete women's schedule. Remember: Home games are held in the QCC Athletic Center and entry into Wyvern basketball games is always FREE! Come and show your QCC spirit and support your teams! IT’S HERE! Quinsigamond Community College’s van, the “Wyvernmobile” is ready to hit the streets! The van will provide an increased QCC presence on the streets of Worcester and the surrounding areas, adding a valuable element to the college’s presence in the community. Expect to see the Wyvernmobile at events throughout the QCC region and make sure to give a wave if you happen to spot it! Do you have an event or location where you’d like to see the Wyvernmobile? Email Josh Martin, Director of Institutional Communications at jmartin [at] qcc.mass.edu and let him know. QCC’s Registrar’s Office announced it has partnered with the National Student Clearinghouse to provide electronic transcript ordering. Requestors initiate the process by going to the Registrar’s Office Page on the Q or the QCC Website. Ordering and payment are both done through the National Student Clearinghouse so students should no longer be directed to the payment center. The requestor has the option to receive text and email notifications from the National Student Clearinghouse during each phase of the processing. “We have already received positive feedback from students regarding the ease of use. In the first 10 business days of offering this service, we have received and processed over 200 transcript requests,” said QCC Registrar Barbara Zawalich. 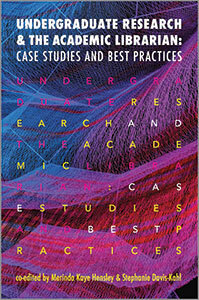 Published by American Libraries Association Press, the book examines how the structures that undergird undergraduate research, such as the library, can become part of the core infrastructure of the undergraduate experience. QCC’s chapter 23 is titled: The Honors Colloquium at QCC: A Decade of Excellence. I live in Sturbridge with my boyfriend and two dogs, Adelaide and Vincenzo Cannoli. Adelaide is a one-eyed husky mix who came from Kentucky as a stray and Vinny is a Papillon mix from Texas. When I have spare time, I play golf with the girls or bocce with my family. When it gets cold out, I like to cook, shop and spend time with my dogs! Tell us about your role at QCC: I work for Josh Martin in the Department of Institutional Communications as the Marketing Manager. I work on Google and social media campaigns, as well as QCC's online presence in general. Digital marketing is what is I love to do. I have only been at QCC for 4 months, but it feels like 2 weeks, time flies here! How long have you worked at QCC? I started at QCC on August 2. What is your favorite movie? I don't really have a favorite movie. My favorite type of movie is pretty much any Christmas movie. This time of year, I could watch anything from Lifetime movies to Elf over and over. What is your favorite T.V. show? : It's hard to pick just one... Ray Donovan, Dexter, the Golden Girls... and of course, QCC's Face the Region! We want to learn about you! Please share your story with your colleagues. Please fill out the attached faculty/staff spotlight form and be the next spotlight. As December is once again upon us, the college would like to remind the QCC community of its inclement weather policies and procedures. These will be used in the event that classes and activities are canceled or delayed due to snow, other inclement weather, or an emergency situation. Cancellation Notification: If it becomes necessary to cancel or delay classes and activities due to the weather and/or an emergency, you may contact the College’s Inclement Weather Line, 508.854.4545, or visit www.QCC.edu/inclement-weather for information. Decisions: The decision to cancel or delay classes and activities will be based upon the best information available regarding the operational status of the campus – including heat, electricity, and/or snow removal; the accessibility of the campus – including the availability of public transportation and street conditions in the City of Worcester and surrounding areas. Conditions may vary greatly within the College’s service area. Students must ultimately determine if they are able to attend classes and if it is safe to do so. Students are encouraged to become familiar with the policies of their instructors regarding making up missed work. Timing of Decisions: Day Classes & Activities (Mon – Sun): Decisions to cancel or delay day classes and activities will be made and conveyed through notifications and radio/television stations at the earliest possible time, but no later than 5:30 a.m. of the day in question. Please Note: Day classes and activities include classes and activities starting before 4:00 p.m.
Evening Classes & Activities (Mon – Fri): Decisions to cancel or delay evening classes and activities will be made as early as possible, but no later than 2:30 p.m. of the day in question. Please Note: Evening classes and activities include classes and activities starting at 4:00 p.m. or later. Delayed Opening of Classes: In some cases, the beginning of day classes and activities may be delayed to begin at the time indicated in the announcement. All staff, except “essential personnel” who may already be at work, should report to work at the delayed start time. The decision to cancel or delay classes and activities will be based upon the best information available regarding: the operational status of the campus – including heat, light and snow removal; and the accessibility of the campus – including the availability of public transportation and street conditions in the City of Worcester and surrounding areas. Conditions may vary greatly within the college’s service. Students must ultimately determine if they are able to attend classes and if it is safe to do so. Students are encouraged to become familiar with the policies of their instructors regarding making up missed work. Satellite Site Operations: Day classes and activities include classes and activities starting before 4:00 p.m. Evening classes and activities include classes and activities starting at 4:00 p.m. or later. Student Clinical Placements, Co-Op Placements, and Externships: Many of Quinsigamond Community College’s academic programs and/or certificates require students to participate in experiential learning; e.g., clinical, practicum, etc. Since many of these external sites remain open during inclement weather conditions, students should anticipate that they might be expected to report to an external site even if the college closes as a result of inclement weather. At the beginning of each semester, faculty program coordinators will inform students within their programs of the procedures they are expected to follow during inclement weather. Text Message Notification: Inclement weather alerts will be sent out as a text message using the QCC Alert system. Students and Faculty can enter their cell phone numbers through The Q. Staff can send email to help [at] qcc.mass.edu . QCC Mobile App: The QCC Mobile App offers inclement weather alerts and emergency notifications. QCC Mobile can be downloaded from Google Play, The App Store, or The Windows Store. Radio and TV Station notification: Inclement weather cancellations are reported on the following radio and TV stations, as applicable. Please note some stations do not allow postings of delayed opening times (e.g. The College will open at 10:30 a.m.). They require delays to be posted in hours (e.g. a 2-hour delay). For these instances, the College’s general business hours of 8 a.m. – 7 p.m. will be utilized. Therefore, a 2-hour delay means the College is opening at 10 a.m. For specific opening times, visit www.QCC.edu/inclement-weather or call the inclement weather line at 508.854.4545. Please do not call the radio and television stations directly OR the college’s main number to find out about inclement weather closings or cancellations. Visit The inclement Weather page or call the QCC Weather Line at 508.854.4545. Where in the World is the Wyvern? 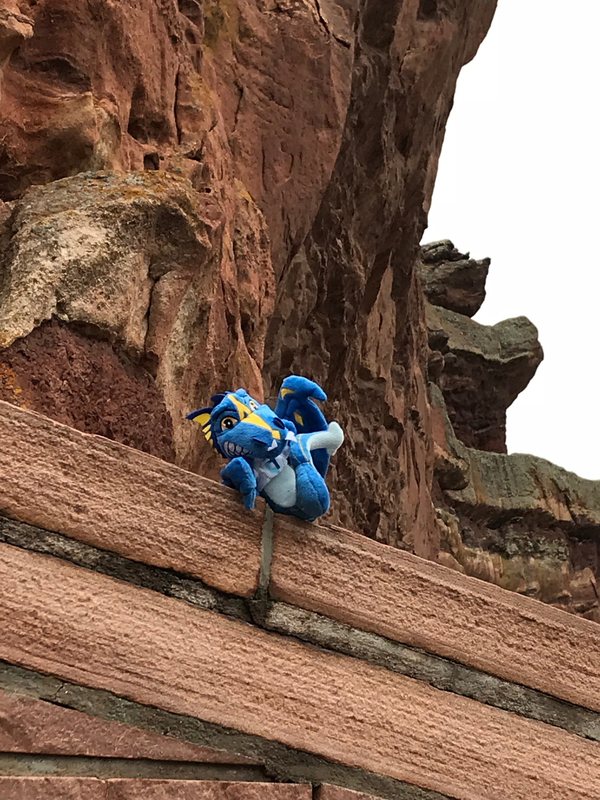 The Wyvern recently spent the Thanksgiving holiday checking out the sights at the Red Rocks Park and Amphitheatre in Morrison, Colorado before visiting the "happiest" place in the U.S., Boulder, Colorado. If you've seen the Wyvern in the wild, please let us know! Send your photos and descriptions through the newsletter submission form. Below is a sampling of some of the articles and press releases published in the local (and sometimes national) media that mention Quinsigamond Community College. On November 27, 2017, Administrative Services welcomed Brian O’Neil as Facilities Manager. Brian brings to the college over 20 years of experience in property/facilities management from the private and public sector. Most recently, he was a Building Maintenance Supervisor I, here at Quinsigamond Community College. Brian holds several licenses and certifications, including a License in Construction Supervision. Brian received a Certificate in HVAC/R from Bay State School of Appliances. On November 5, 2017, Enrollment Management, Student Engagement and Community Connections welcomed Young Mi Chun as Records and Registration Systems Manager. Young Mi brings to this position over 15 years of customer service experience and 3 years of experience at QCC. Most recently, she was a Clerk IV in Academic Advising here.Young Mi earned a Bachelor of Literature and Japanese Language and Area Studies from University of Ulsan and a Bachelor of Science in Finance from Arizona State University. Please join us in welcoming Brian and Young Mi into their new roles.